Oh, and yes, we know this is Ile-a-la-Crosse, but WordPress (or rather, Yeost) has a problem with the dashes so I took them out. So here we go, from Archibald McDonald’s journal of his voyage with Governor George Simpson in 1828, found in Peace River: Journal of a Canoe Voyage from Hudson’s Bay to the Pacific, Journal of the late Archibald McDonald, Esquire, Chief Factor, Honorable Hudson’s Bay Company, who accompanied him. Surprisingly, you might find this book hidden in your local library. I was certainly amazed to stumble across it in mine! Being close to the first portage, we did not start before daylight. Breakfasted at the head of the first grand rapid in English River or Churchill waters, into which we fell after making the portage this morning. Lost one of our paddles in the Barril Portage, halfway between Portage des Iles and the Rapid River carrying places. Dined at one. Saw a number of black bears here, but they made for the woods. Picked a good many ripe raspberries, currants and gooseberries on the portages to-day. Showers of rain all day. Arrived at Rapid River by four o’clock, where we remained nearly an hour for Mr. Heron, who embarked with us for Athabasca. 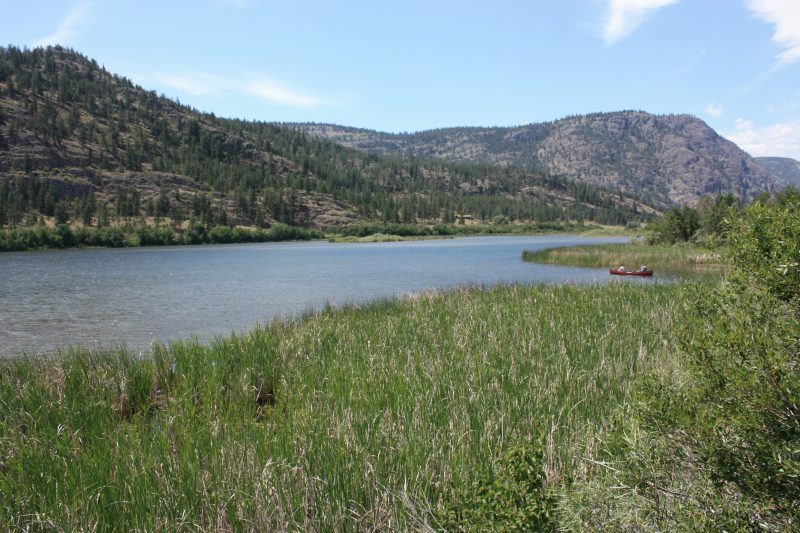 Obviously Rapid River [House] is an HBC post on the Rapid River, and Mr. Heron might be Chief Trader Francis Heron, who in 1828 traveled in with the York Factory Express to Fort Colvile and took charge of that Columbia River post. To travel with the incoming express, he would have to make his way to the Athabasca River and Fort Assiniboine, and so I presume it is he. I might be wrong, however. Interestingly, neither Governor Simpson nor Archibald McDonald would be going anywhere near Fort Assiniboine, so we will have to keep an eye on how Heron makes his way up the Athabasca River to that post. Here we took 45 lbs. fine pemican, and a few pieces of dried meat. Got up little Discharge in good time, and encamped at about three leagues from the Rapid River House. The best pemmican is made at the Company’s forts on the Saskatchewan; it is both good and cleanly made and from the care taken in its manufacture it will keep for a long period if placed in a dry place. Fine pemmican is made by pounding the meat finer [than when making coarse pemmican], using marrow fat instead of hard grease and by adding in the mixture berries (poirs). [“Poires” is Saskatoon berries]. The men were given Coarse pemmican; the Gentlemen ate the fine. Did this happen in every express and brigade that crossed the country? I don’t know. But Governor Simpson and Archibald McDonald received their fine pemmican from a post in the middle of nowhere, and so it must have been manufactured everywhere. The only alternative would have been, that Governor Simpson sent his food supplies ahead of him and had them held for his arrival at various posts along their route. (There are Rapid River records available at the HBCA [B.174], but none are available for this time period). Thursday 31st. Got under weigh at three o’clock. Made the Mountain Portage early, and before breakfast passed the Pine and other Rapids. In the forenoon, made the “Devil’s Portage,” at the head of which my canoe had to be gummed, which caused a detention of half an hour. After dinner we made a number of hauling places before coming to Trout Portage, in one of which the Governor’s canoe took a sheer, and was nearly being dashed against the rock. At half-past seven o’clock encamped upon a green hill about half way across the Lake [Probably on one side of the Lake]. The piper gave us a few marches before supper. This is admitted to have been a hard day’s work. Thermometer in shade at noon, 70 degrees. Mr. Heron took his turn to watch last night. The piper mentioned here is Colin Fraser, personal assistant to Governor Simpson and a bagpipe player of note. In his York Factory Express Journal of 1841, George Traill Allan makes special mention of Colin Fraser, then in charge of Jasper’s House. “Upon our arrival there,” he wrote, “We received a regular highland welcome from the person in charge, Colin Fraser, formerly Piper to Governor Simpson, but now promoted to the charge of Jasper’s House.” Interestingly, Francis Heron’s job as watch-keeper was to keep his eye on the Canadien voyageurs who were actually keeping the watch, guarding canoes and supplies, to ensure that they did not go to sleep on the job. Tuesday, 1st August. Started at half past two o’clock, and got to Portage de H….. [possibly Portage de Halliers, Thicket Portage]. Lac Mille d’Ours [“Thousand Bears,” probably today’s Black Bear Lake?] took us to three pm, and made Portage Femme. Pine Lake took us an hour; crossed that portage also. Head wind in Lac de Souris [House Mouse Lake?]. Put up on the sandy point, a fine dry encampment, where we picked up a good many berries. Saturday 2nd. Made an early move today. Got over Serpent Rapid, Sandy Lake, Grassy River, Rapide Milieu and Rapid Croche. A hard day’s work. Governor shot a pelican, a few ducks, and a couple of geese. Our second keg of spirits from York Factory was done. “Rapide Milieu” is probably Millieu, or Middle Rapid. Rapid Croche translates as Quaver Rapid, or perhaps even Crooked Rapid. Sometimes it also means Cross, and the men did not know how to spell it. There are many Rapid Croche on the various rivers the HBC men passed over. Sunday 3rd. Got under weigh about the usual hour. Crossed Lake Primeau, breakfasted at the head of Portage des Pins. Here the men were found to be entirely out of provisions, having of their own accord left at Rapid River half of the pemican provided to each canoe. After a sharp lecture upon their imprudent conduct, and an assurance from them never to be guilty of so much indifference to their own absolute wants again, some dried meat of our own was served out for the day. At half-past one, got to head of Portage de Souris [or Source, it is impossible to make out some of the names in French in the M.S.] Got over the Shaggunnu by five o’clock; day excessively warm. Encamped at Point de Gervais near the Straits. “Shaggunnu” in this journal, was “Shagoina” in John Work’s journal, previous post. Monday 4th. Breakfasted and changed [their clothing] at Point au Sable. Arrived at Fort of Isle a la Crosse by eleven am where we found Mr. Deschambeault and the family of Mr. Chief Factor [John] Charles. Remained for the day arranging our canoes, &c.
Somehow or another I find that all these stories are connected, one way or another. 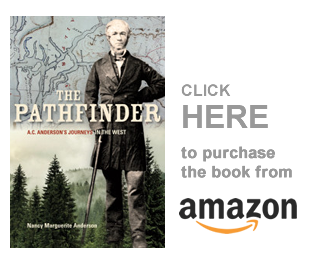 This story is, in the end, connected with Alexander Caulfield Anderson’s explorations of the Fraser River in the mid 1840’s. But we are not there yet.